After months of waiting, the Thargoids are finally here, in force. Frontier Development have clearly been planning this for a very long time. Not only has the base game improved over the years and throughout each iteration of updates, but the fictional additives and gameplay elements have also evolved. We went from a fairly basic, but no less enjoyable experience, when Elite Dangerous launched back in 2014 for PC and then the Xbox One and PS4 in 2015 and 2017 respectively. But the one elements we’ve all expected to make an appearance was the mysterious alien presence dating back to the original games. Back then the Thargoids were unbelievably basic in design. But that’s to be expected, considering they made their last appearance in an Elite game back in 1995. But they were no less deadly. Now , of course, technology and the gaming industry has progressed. The regular run of yearly releases such as FIFA and Call of Duty, though still popular, are steadily being replaced by persistent environments that are updated with new features and a bag of new swag every few months. Both Destiny and Elite Dangerous follow this mantra of ‘games as a service’. And it’s incredibly popular. But enough about that. We’re here for the Thargoids. 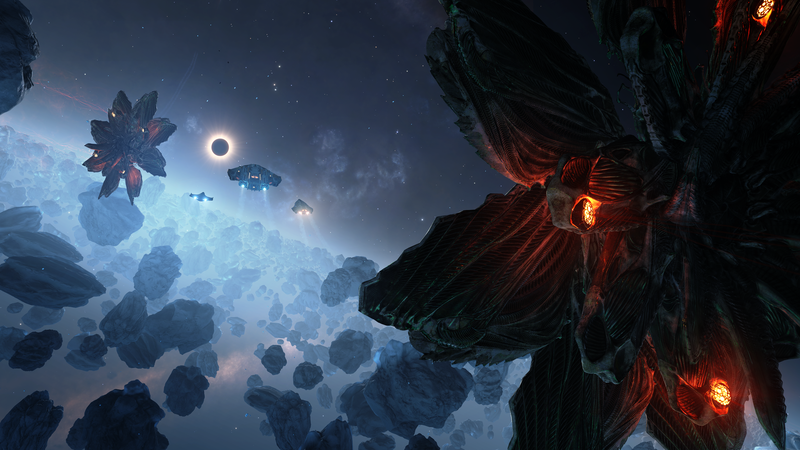 Yesterday, the latest update by Frontier Developments for Elite Dangerous (2.4) was released. And players (Commanders) have already had numerous encounters with the Thargoids already, with expected results. Humanity is woefully outgunned. Apparently, conventional weapons have little to no effect on the Thargoids, because obviously a lot of players are shooting first and asking questions later. But even when outnumbered the Thargoids aren’t to be toyed with. Check out Sik’s encounter below. The Thargoids we know and usually fear date back to the 1995 release First Enounters. And back then we dealt with our alien foe with a fungal-based virus that prevented them from using interstellar travel, effectively rendering them immobile. But since then, Frontier have steadily introduced Thargoid elements into Elite Dangerous with each new update. Early encounter were with unusual probe like objects in space and then crystal-lie structures growing from barnacles on the surface of seemingly random moons and planets. After that came the crashed vessels, a face-to face encounter and then vast alien structures half buried on dozens of planets. But that was all a warm up act. Now they’re here in force. And presumably with a grudge to bear. Let us know if you’ve had any encounters, or what you plan to do when you meet for the first time. Next Post Say Hello to the Thargoids!